The Social Capital Theatre is about to come alive with some of Canada’s best emerging and established talent with The 2nd Annual (ever!) Short Short Play Festival. The festival runs from April 27th through May 1st, 2016 and is unique in that it features plays that are 20 minutes or less. The diverse lineup is presented as a “tasting menu”, with three plays during each time slot, giving the audience a wide range of characters, genres, and themes all within the span of one viewing. 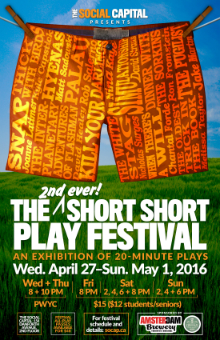 We had the chance to speak with Melyssa Ade, the Artistic Director of The 2nd Annual Short Short Play Festival. Where did the idea for the festival originate? The SSPF started as the brainchild of Ralph MacLeod and Carmine Lucarelli, who operate the Social Capital Theatre. They were eager to introduce their venue to the theatre community and to establish the SoCap as a viable venue for diverse theatrical productions. In discussion with Melyssa Ade and writer Ron Fromstein, the idea of a festival for plays that were shorter than traditional one-acts grew. The response to our call for scripts has been consistently impressive. There IS such a thing as the twenty minute play. There are gifted writers exploring this format and a short rehearsal period is enticing to some very busy actors; the whole experience is intense and fun. Presenting small and mighty works, full stories in concentrated form, is a challenge we are happy to strive for as we grow the festival each year. Is there an overall theme for this year’s festival? Each of the twelve plays we have selected are unique and together they make up a diverse program with a wide range of theatrical styles and voices. Interestingly, common themes run through many of the plays: hope despite loss, a desperate need for connection, reconciling with the past. And talking dogs. What makes The 2nd Annual Short Short Play Festival unique from other theatre festivals? Each play runs less than twenty minutes. They are bite sized and various – like a tasting menu. Despite their short running time, they are packed with emotions and shifts and tensions and possibilities. Sometimes a story only needs ten minutes. For those who attended last year, have there been any major changes to the festival this time around? How does your affiliation with the Toronto Cold Reads series help or influence your work with the Short Short Play Festival? The Toronto Cold Reads are a vital artery of both acting and writing talent and six of the plays in the festival this year have been read and supported by TCR. TCR has proudly sponsored the new play “Simulationship” by David Straus, with Anna Douglas. And this year TCR founder Jane Spence and co-curator Marcia Johnson are both performing –that’s a treat! Shows run Wednesday and Thursday at 8pm & 10pm, Friday at 8pm, Saturday at 2pm, 4pm, 6pm, 8pm, and Sunday at 2pm, 4pm, and 6pm. Please see the website for the full schedule. Tickets are Pay-What-You-Can Wednesday and Thursday, and range from $12 for students/seniors to $15 general admission Friday through Sunday and can only be purchased at the door. Festival All-Play passes are available for $48.